An Ancient Solar System...: Answers for authors: What would a battle in orbit be like? Answers for authors: What would a battle in orbit be like? Above: A full solar eclipse, seen from space. It has nothing to do with battles in space, it's just cool. "What would a real battle in orbit be like?" 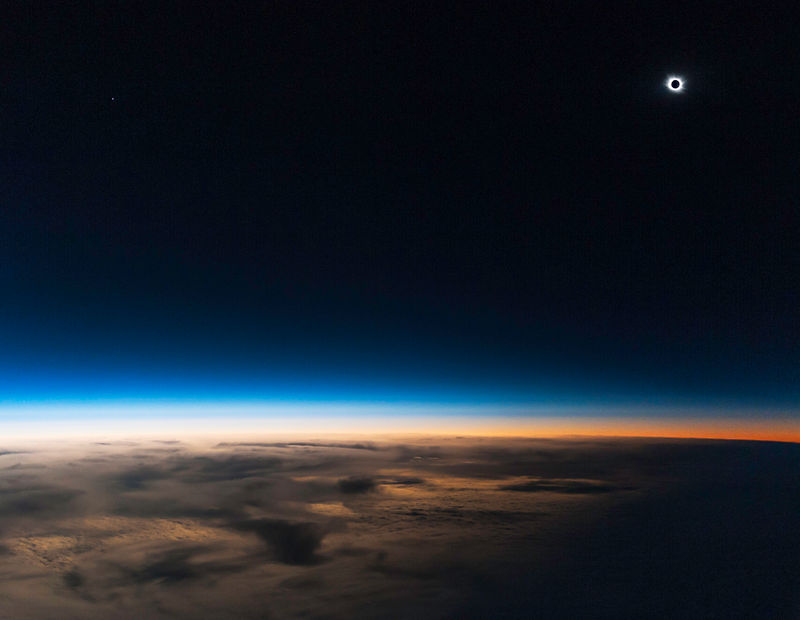 What would two nations of Earth fighting in space be like? What would Earth fighting off an invasion from extraterrestrials be like? Let's look at the first one this post and save the alien invasion for next time - although bear in mind that much of what we're about to look at could apply to aliens with similar technology levels to Earth's. As far as I can find out** no armed confrontation has ever taken place in space. But there has been a hell of a lot of military activity in Earth orbit, and the information released on it gives us some material to work with. Everything that gives modern western forces their technological and tactical edge uses space-based systems: Drone surveillance, Reaper drones, battlefield communications, guided smart bombs... even tanks depend on satellites. The images of Russian troop movements around Ukraine came from them, and the weapons that destroyed Saddam Hussein’s military wouldn’t have hit their targets without them. Even presidential phone calls rely on a small fleet of them — the Advanced Extremely High Frequency constellation. What kinds of examples can we look to? Since it's a real field of warfare today, we have something to base our pace battle on - and a motivation for it: Dominate space and you can dominate the air, the land, and the sea. The Soviet Almaz space station, built to orbit over American territory and take pictures, was fitted with an R23M cannon, in case any sneaky Apollo astronauts decided to board it and leave the cosmonauts hogtied with gaffa tape like floaty space pinatas. The design was abandoned, as the gun's recoil during test firings kept changing the space station's orbit. Ronald Reagan initiated the 'Star Wars' program (officially called the Strategic Defense Initiative) - essentially a series of satellites and ground bases toting various advanced weapons - never really produced much, as the idea was way ahead of the era's technology. But it laid a lot of foundation for future military missions. In the 1950's and '60's the US experimented with using nuclear weapons to wipe out enemy satellite arrays – a nuke produces no shockwave in space, but emits a pulse of rapidly changing electric and magnetic fields that cook the chips of any computer caught in the blast radius. The tests, called operation Fishbowl, were so successfully they created a miniature aurora, and took out six satellites... as well as most of the electronics on the island of Hawai below. The Space Shuttles, those great symbols of peaceful American space exploration, were re-designed (on the insistence of the National Reconnaissance Office) to fly on highly secret military missions, often with military crew. On one occasion astronaut Ken Mattingly, who was also a rear admiral by the time he retired, was ordered to file false flight plans and travel documents to cover up taking the shuttle on a secret mission. The Russian satellite known as Kosmos 2499, and Object 2014-28e, was launched on a rocket meant to be carrying three communications satellites. Only later was it revealed to have been carrying 'object 2014-28e' as well. Once in orbit the mysterious satellite did something very odd: It chased down other Russian space satellites, and rendezvoused with the spent booster stage that placed it into orbit. US air force has been operating its small fleet of Boeing X37B unmanned mini-shuttles since April 2010, smashing records for length of time spent in space, and performing "classified missions in support of long term goals". 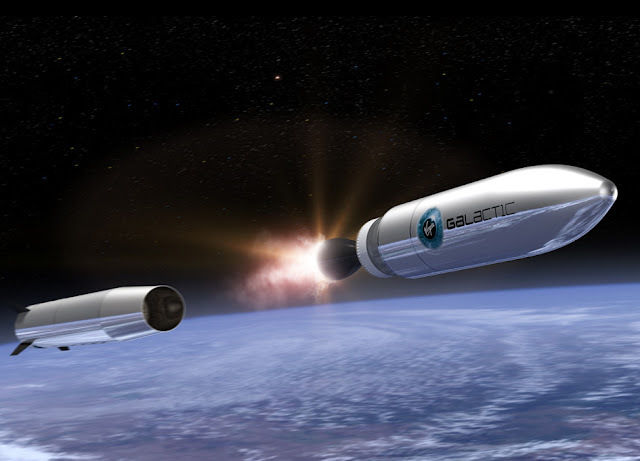 It is certainly possible an X37B could chase down a satellite and damage it with a weapons in its payload bay. In 2008 the Chinese decided to fly small satellite, called BX-1, close to the International Space Station. It then performed a mission in the space around a Chinese space station that had many of the hallmarks of an anti-satellite weapon test. To add some defence to this potential space offence, Princeton university (among others) think it's certainly possible to fit countermeasures to satellites: Better manoeuvring thrusters, jamming devices, decoys, or even cannons like the old Soviet Almaz space station, are all rumoured to been tested. And a report (linked here), dating from the Reagan administration, lays out the approaches being considered at that time - including laser and particle based beam weapons. A real incident to work from? There has been an incident where one nation's anti-satellite weapon (accidentally) destroyed another nation's spacecraft: On January 11 2007, 865km above the Chinese mainland, a weather satellite was blown to smithereens by a missile fired from the Xichang spaceport. More than 2,300 pieces of shrapnel— each lethal to anything it hit — were released into orbit. Think a small version of the orbital debris storm in ‘Gravity’. If you just went 'what?' go and watch the movie 'Gravity'. Go on, this is a blog post, it's patient. Done? Like that, but smaller – more of a space squall than a storm - but it took out the Russian BLITS satellite. In effect the incident was ignored - and BLITS was so small and inexpensive the worst Russia was likely to do was sue. But it's a salutary lesson: A full on battle in Earth orbit would have a huge potential for collatoral damage. Sooner or later, every space fairing nation would lose. But there's an element here that we're missing: Although blowing up or sabotaging enemy satellites is fun, cool, and looks great on your CV, the most energy efficient way to shut them down is to hack them. Where it can be done not only can you deprive an enemy of the satellites use you can use it to send them misleading data – although you might want to hold off on the satellite readings of flying Scotsmen with laser powered bag pipes, for fear of giving your game away a wee bit. A recipe for a realistic space battle? Nothing would happen for ages, and no other vehicles would be visible. Then you'd explode - hit by a missile, or debris moving too fast for the human eye to see, fired from the ground or another craft too far away to see. ASAT missiles would be fired at those craft in a low enough orbit to be hit, and clouds of debris (intentionally released and just from casualties) would pose a constant threat. If the battle went on for long enough, eventually just being in orbit would be seriously risky. There might be chases, as a saboteur satellites tried to close with a target. Both would, again, be too distant for human eyes to see for most of the chase. The target might defend by trying to manoeuvre away, jam the attackers signals to ground, deploy decoys, or perhaps even use physical weapons like Almaz's cannon to shoot it's pursuer to bits. There could also be standing decoys, designed to fool ASAT weapons into hitting a worthless target, being deployed ahead of the battle. Satellite constellations, ground stations, and other spacecraft like the X37B, would be trying to jam each other electronically. In an all out conflict nukes would be being set off as EMP weapons. 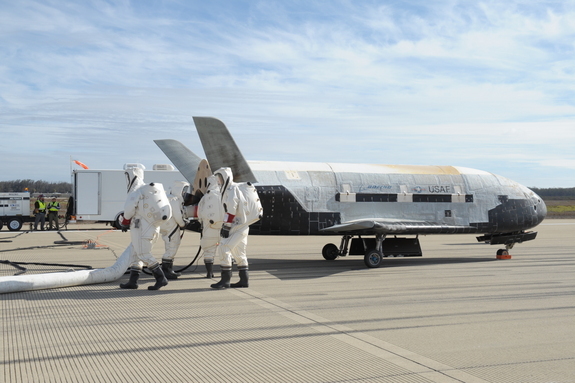 Above: An X37B being checked after landing. The HazMat suits are because the hydrazine used in it's manoeuvring system is toxic by the way. At least... I assume that's what it's for. Imagine if you farted in one of those things. I'm not a soldier - so all I can say is that this is a possible image of war between modern day human forces in space. All of it would be trying to gain advantages for air, sea, or land forces. It would be battle of silent, often almost invisible and instantaneous, destruction. It would be largely fought between robotic satellites and remote controlled spacecraft, responding to pre-programmed instructions, or general commands from ground bases - Human reflexes and co-ordination simply aren't up to the speeds and distances involved, once vehicles got close to each other. The best thing a manned vessel in orbit could do is return to Earth immediately - out there it would be nothing more than a target. But what about the green four eyed elephant in the airlock? What if we had to fight off an extra-terrestrial invasion? *That's a big ol' lie, there are zillions, but keeping it to the two that pop into my brain fastest keeps the post to a readable length, and gives us a blog sized entry to the topic. **That doesn't mean it's never happened, just that it was kept quiet if it did.